LOS HERMANOS DAVID Y DARIO PEREYRA, FUERON CLAVES PARA LA PRIMER TEMPORADA DE SOLDASUR, POR ESE MOTIVO LA DIRIGENCIA, LOS TIENE EN CUENTA PARA LA TEMPORADA 2009, QUE SIN DUDA SE VIENE CON TODO. TODOS LOS EQUIPOS QUIEREN GANAR, NADIE QUIERE REGALAR NADA. FUTSAL A.F.A ESTA CRECIENDO A PASOS AGIGANTADOS,YA LO DEMOSTRO EN TODO EL 2008. DARIO "PITU" PEREYRA TUVO UN MUY BUEN AÑO, FUE EL CAPITAN DE SOLDASUR Y TAMBIEN FUE EL GOLEADOR DEL CONJUTO FERRETERO CON 15 TANTOS. 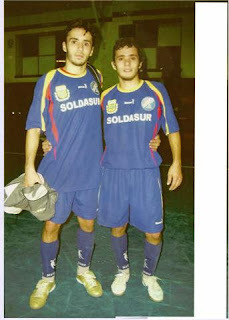 LOS HERMANOS PEREYRA SEGURAMENTE VAN A EXPLOTAR EN EL 2009.